I'm not interested in finding a winning formula and riding that horse until it's taken its last breath. I don't want to create an art factory that churns out slight variations of the same old ho-hum art. I seek to grow closer to being my true self, uninhibited and unapologetic. I take this journey through my art and progress is made only by creating bold works that truly get my blood flowing. A powerful vehicle that allows me to move along that path is taking risks through experimentation. And one such experiment led to the creation of my latest mixed media creation, The Pirate. Most of my paintings begin to take shape in my mind as I go through my day, taking note of what catches my attention. Being a visual artist, it is most often something that I see, like an old abandoned house nestled in the Michigan woods or a new, unexpected color combination that my 4-year old son Ivan is wearing after picking out his clothes for school. At times it's something I hear, like my Dad talking about "earning my nut" or listening to my pastor preach about being "bound by the opinions of man". I try to be cognizant of where my mind wanders and delight in this mental meandering. Images begin to materialize from this soup of experiences and, if they're sticky enough, those daydreams make their way into my sketchbook. 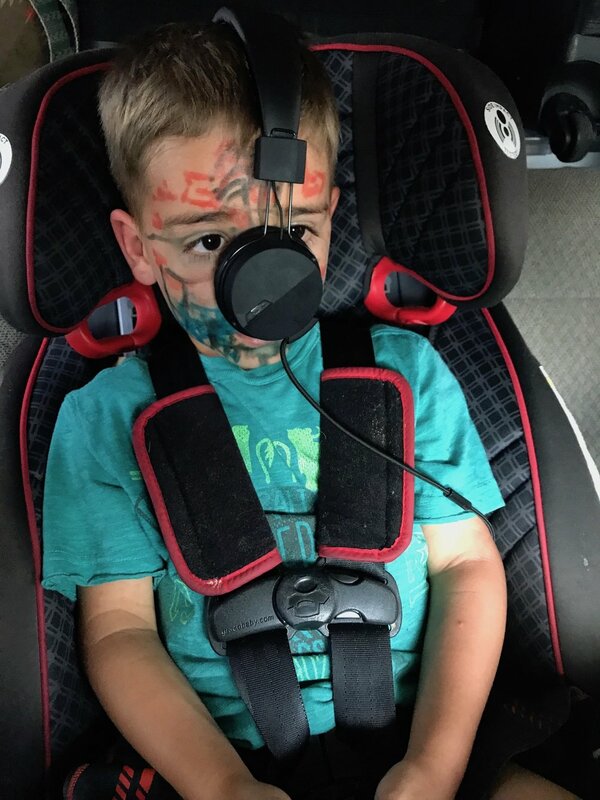 Some interesting inspo from a 4 year old on our most recent road trip to Florida. Sketchbook jots get siphoned into ideas for paintings and, as a chronic list-maker, I rely on a running list on a whiteboard in my studio with the appropriate heading "IDEAZZZ". I rarely plan out my painting schedule and instead, when it's a painting day in the studio, I stare at the list and decide which idea is most exciting. Recently, "Pirate" jumped out at me as a fun, new direction to take The Jobs of Yesteryear Series. I remember jotting it down on the whiteboard after hearing a story about Somali pirates and thinking about how much that word has evolved over time. Or maybe it was hearing a hearty "AAAARRRGGGHHHH" from one of the groomsmen at my sister's wedding that got me thinking about pirates. In any case, it's hard to say exactly where this idea began, but my point is that inspiration for my artwork can come from absolutely anywhere. The whiteboard that keeps me organized with some Orin scribble art. So, after deciding to create The Pirate, I sat down in the studio and began reading about famous pirates and their escapades. I then started sketching out some ideas inspired by the stories and imagery that I encountered, and the composition began to take form. With The Pirate, I really like this old etching of a woman pirate named Anne Bonny and decided to play off of its composition. One direction that I've been trying to go in is to include more of my sketching into my paintings. I like the loose quality of sketching and appreciate how the hand of the artist comes through in the final product. For months, I'd been working through various ideas and talking with my wife/boss/muse/co-pilot, Ashley, about the various ways to accomplish this. After much tinkering, I still didn't feel like I was there. But when I sat down to create The Pirate, I had a breakthrough. Instead of collaging torn bits of paper together and painting on that to make the figure (a process outlined in detail in another blog post, Job Creation), I decided to simply draw the pirate with a pencil on watercolor paper and paste that drawing to the wood. This makes the figure stand out even more and gives them a ghost-like quality that adds to the historic nature of the story. My sketching is front and center and the composition balances out well with the white figure in the foreground. Hooray! When I meet with young artists, I always stress the importance of experimentation in the creation of your art. You must stay disciplined enough to never get too comfortable and to always go bold when given the chance. This keeps the art fresh and keeps the artist happily growing. Stay tuned as I continue to gather inspiration from my journey and find new, exciting ways to tell my unfolding story.